Born in 1918, Achille Castiglioni was a celebrated Italian designer. He studied architecture at the Polytechnic University of Milan and would later distinguish himself with a variety of creations. His brothers Livio and Pier Giacomo often collaborated with him in his work. Amongst his most well-known products are the Luminator Lamp-post, the Mezzadro Stool and many others. 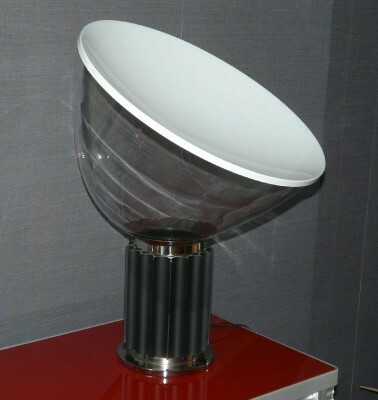 However, the Taccia lamp is one of his most appreciated designs. With its simple and rational style it has been incredibly successful. The Taccia Lamp can be placed on the bedside table or on the floor. It was created in 1962 by Achille and Pier Giacomo Castiglioni for Flos, a pioneering Italian company. It can be adapted to any environment. In keeping with the modern world, it uses LED technology. As the light points upwards, it will fill even a large space and the white light perfectly details any room. It's not just a practical design though. This sculpture is a piece of art. Roman columns can be seen in the aluminium pedestal with its glass lamp and it's not surprising it has been displayed in a museum. The Taccia perfectly reflects the Castiglioni brothers' style, particularly Achille's. Inspired by a car headlamp, it's a brilliant and stylish combination.